Fun with numbers: Will B/X Essentials have a higher page count than B/X? 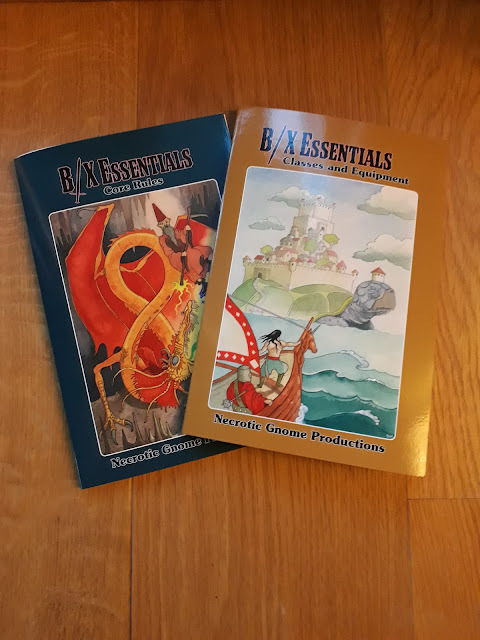 There's a thread about the first B/X Essentials book at Dragonsfoot. A couple of people in the thread (or maybe it was just one, I forget) were grumbling about the page count of my books being higher than the original B/X books. The dumb answer to the question is: yes, the total page count will be higher. But it's a deceptive question and the wrong one to be asking. Simply comparing page count isn't a useful metric, as the books are different sizes -- B/X Essentials is printed at 6" x 9", whereas B/X has much larger US Letter pages (8.5" x 11"). It's clearly possible to fit much more on a Letter sized page than it is on a 6" x 9" page. B/X comes to 128 pages at 8.5" x 11". That makes for a total page surface area of 11,968 square inches. A single 6" x 9" page is 54 square inches. That means 221.6 pages of that size would have the same surface area as the 128 Letter pages of B/X. 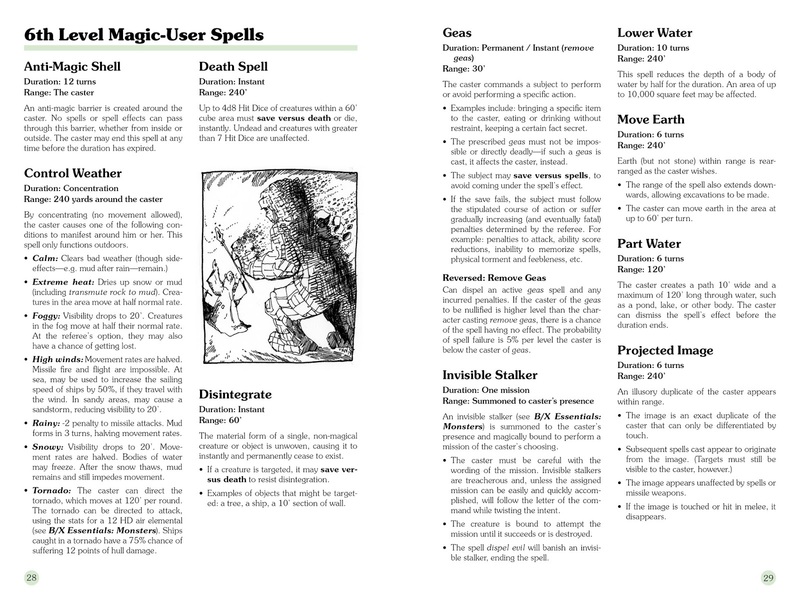 The books that I've laid out so far have the following page counts: 34 (Core Rules), 44 (Classes and Equipment), 34 (Cleric and Magic-User Spells), for a current total of 112 pages. That leaves me 109 pages for the last two books (4: Monsters; 5: Adventures and Treasures). As the print format I'm going for (staple-bound) has a maximum of 48 pages, the complete B/X Essentials line will, by definition, come in at most at 208 pages (112 + 48 + 48), for a total of 11,232 square inches of page surface area. 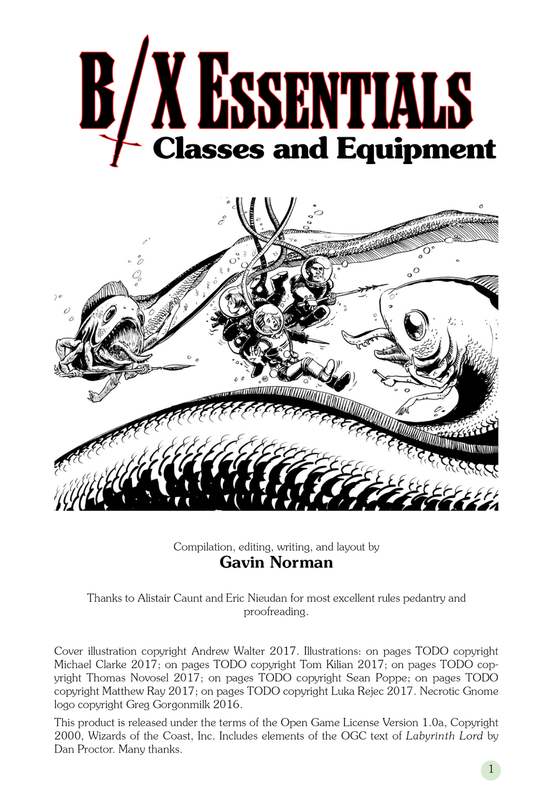 B/X Essentials: Classes and Equipment: Illustrated PDF Out Now! I am delighted to announce the publication of B/X Essentials: Classes and Equipment! 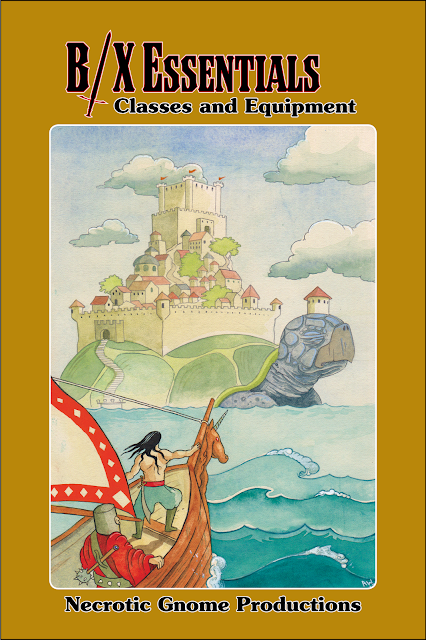 This is the second book in the B/X Essentials series, and contains the rules for the standard seven character classes (cleric, dwarf, elf, fighter, halfling, magic-user, thief) and equipment from weapons, armour, and ten foot poles all the way up to mounts, sea vessels, and castles! Illustrated, laid out PDF edition. For tablets or home-printing. Plain text edition (RTF). For rules tinkering. Google docs edition. For online reference / further rules tinkering. 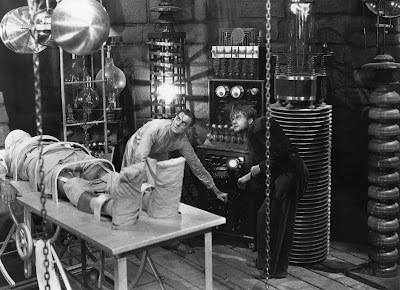 I shall be starting the print setup process forthwith! Print editions (and the print / PDF bundle) expected to go live in the next two weeks. Note: unlike with the previous book in this series, people who buy the PDF now will not receive a discount coupon for the print / PDF bundle. This is due to limitations of the OBS coupons system. If you want the print / PDF bundle, please be patient. It should be out in a couple of weeks. B/X Essentials: Classes and Equipment: Finalised Text Edition Published! Spell book illustration by Thomas Novosel. The text edition of B/X Essentials: Classes and Equipment is now out! It's shared online here, in google drive. Illustrated PDF and print editions coming very soon! I'm expecting the last pieces of artwork for B/X Essentials: Classes and Equipment this weekend and have been going through the book this evening making a few final tweaks to the layout in preparation. The index of tables is done. Everything is hyperlinked and cross-referenced, ready for the final PDF export. The wait for the publication of this book should now be pretty short and hopefully bearable. 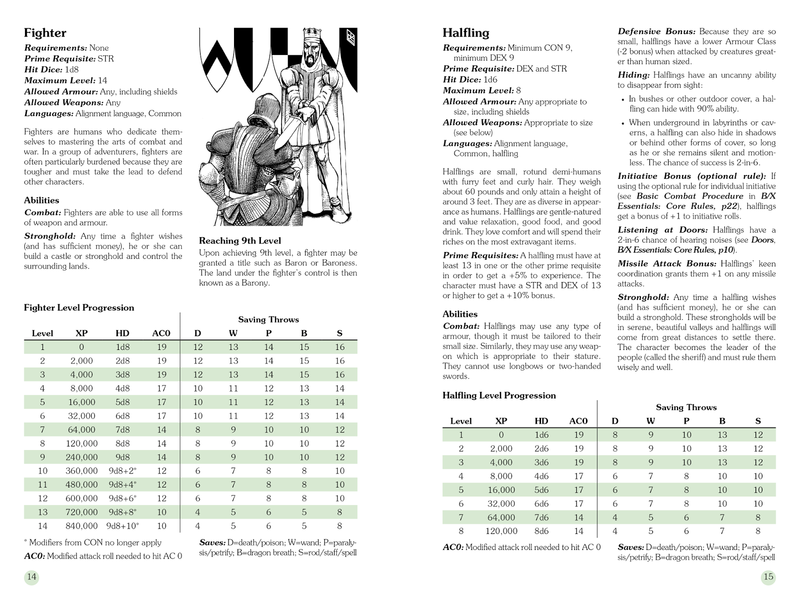 In the meantime, here's another example spread from the book, featuring the fighter and halfling classes and a wonderful illustration by +Matthew Ray. 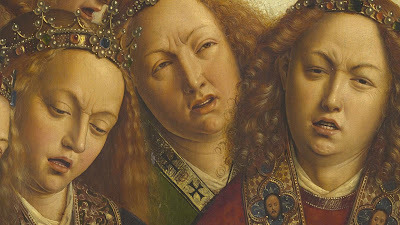 I'm expecting the complete set of illustrations to make their way to me over the next week, so next weekend I'll be frantically pasting them all into their allotted spaces in the document, doing my own final read-through, and beginning the publication process. Excitement mounting! 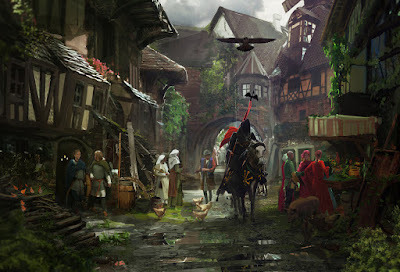 For a long time, since the dawn of Dolmenwood (long before the Wormskin epoch), I've wanted to write up a fairy-themed elf class for the setting. I've had notes lying around for it in rough form for ages and this afternoon felt inspired to have a look at them. It seems that the stars were in alignment, because an hour later I've hammered out the rough notes into an at least half-finished draft. Ageless denizens of Fairy who sometimes cross over into the mortal world for reasons that they seldom reveal. 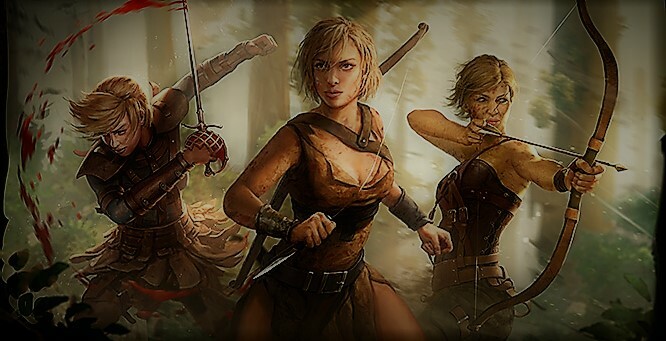 Player character elves are assumed to be rare individuals who spend most of their time in the mortal world -- they may be exiles from the undying land or adventurers fascinated by the exotic scents of time, decay, and mortality. Physically, elves are similar to humans, though they tend to be lithe of frame and fair of face. Despite their surface similarity to mortals, it is always possible to identify an elf for they carry an air of “otherness” about them, seeming somehow more vibrantly present than mortals. Additionally, most elves have at least one physical characteristic that makes him or her obviously non-human: pointed ears, violet eyes, or iridescent skin are examples of common qualities. An elf with a CHA of 13 or greater gains a +5% bonus to experience gained. If the elf’s CHA is 16 or greater, the bonus increases to 10%. Contrary to the standard rule, an elf may raise his or her CHA score by point swapping, during character creation. Combat: Elves are naturally talented fighters and may use any weapons and armour. Immortality: Elves can be killed but do not die naturally. They are immune to the mundane illnesses of mortal-kind, but may be affected normally by diseases of magical origin (e.g. 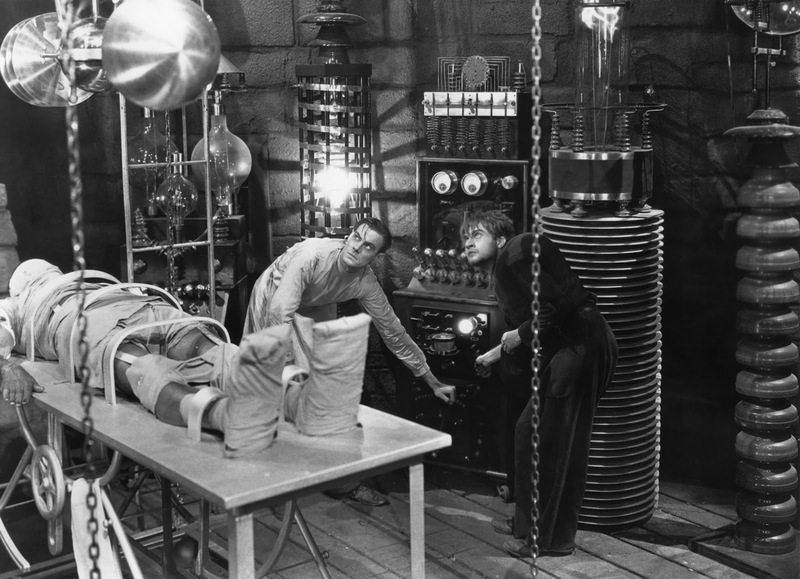 cause disease, lycanthropy, the touch of a mummy). Elves also cannot die of thirst or starvation, though a lack of sustenance drives them insane and sadistic. Unearthly beauty: As mentioned above, all elves -- both kind and wicked -- are beautiful, by mortal standards. For CHA tests which are purely based on physical attractiveness, an elf is always treated as having a CHA score of at least 14. 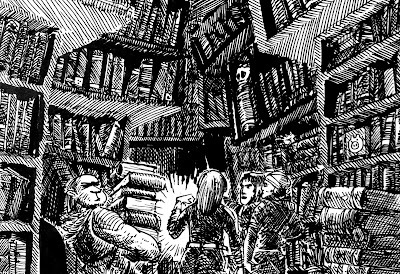 Subtle sight: Elves have a 3-in-6 chance of noticing passages to the Otherwold. Magic resistance: As beings of Fairy, where magic is in the very fabric of things, elves have an increased resistance to magic. They are immune to sleep spells, gain a +2 bonus to saving throws against charms and illusions, and are unaffected by the paralysing touch of ghouls. Runes: An elf may be granted the use of magical runes by performing services for a fairy lord or lady. Each rune has a different effect and a limitation on its usage (once per day, once per week, once per experience level, once ever, etc). An elf may know a maximum number of runes equal to his or her level. Read magic: Given an hour of peace and solitude, an elf may read magical scripts and runes, as if by the magic-user spell read magic. Magic items: Elves have a natural affinity for the arcane and are able to use any magic items usable by magic-users. 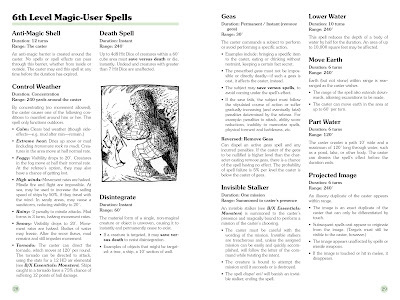 This includes casting spells from scrolls (with the use of their read magic ability). Cold iron: As fairies, elves are vulnerable to iron weapons, suffering double damage on a successful hit. Silver: Elves find mortal silver base and disgusting. An elf in physical contact with silver is sickened and suffers a -2 penalty to attack rolls and saving throws. 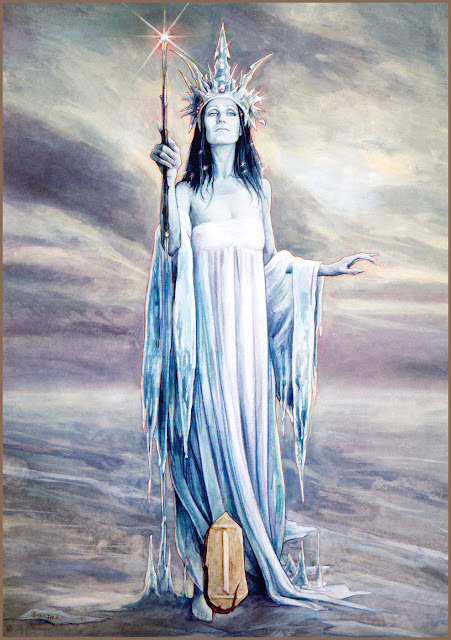 Resistance to divine aid: There are no gods in Fairy and the gods of mortals are loathe to aid its folk. Whenever an elf is the subject of a beneficial clerical spell, there is a 2-in-6 chance of the spell having no effect on the elf. Upon reaching 9th level, an elf may establish a stronghold and domain, according to the standard rules. * Hit point modifiers due to CON no longer apply. Vanishing. 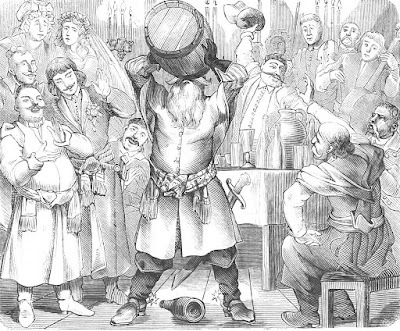 The elf disappears from another creature’s sight for one round. This glamour may only be used on any individual once per day. Changeling. The elf’s facial features are malleable according to his or her will. Subtle features (e.g. eye colour, hair colour) may be switched in a moment. More dramatic changes take a turn of concentration to effect. Seeming. The elf may make his or her garb appear as he or she wishes. The glamour is only visual, however, and is revealed by touch. Silver tongue. By using ancient modes of the high elfish tongue, the elf is able to communicate with any being, including dumb animals. This ability may only be used to communicate in one language per day (e.g. one mortal tongue or the speech of one species of animal). Disguise object. An object in the elf’s hand is made to appear as something else (of similar dimensions). The glamour lasts until the object is touched by another being. Moon child. The elf’s eyes perceive night as it were day. Even the blackest tomb is perceived as if by gentle moonlight. I want to add more glamours. I will detail the elf runes and how they're gained. I will add more detail (including some options) to the stronghold ability at 9th level. Of course, none of this has been play-tested.